A 16-pump ARCO gas station (including 4 diesel pumps), with a carwash and 24/7 convenience store (selling soda, chips etc.) is now being proposed at Highway 116/Stony Point Road in an unincorporated, semi-rural area of the County, less than 2 miles from Cotati on the way to Sebastopol. The handful of small, locally owned businesses on the site, including Cali Kind tie-dye clothing shop, the Pond & Garden Nursery and Martin’s Market & Deli would have to go – pushed out by massive, out-of county corporate developers. There are already five gas stations within 2 miles of this site, four clustered around the Hwy 116/Hwy 101 intersection, and Bill’s Valero to the north on Hwy 116. There are also two carwashes, a full service and a self-service, less than 2 miles away in Cotati. Over 10,000 sq. ft. of impervious surfaces would be added. Well water, a septic system, wastewater from the car wash and run off from the gas station would all supposedly be dealt with on site, while ditches from alongside the site run into nearby Gossage and Washoe Creeks, tributaries to the Laguna de Santa Rosa – a wetland of international significance. Sonoma County is already riddled with Leaking Underground Storage Tanks, including within a few miles away. Underground gas tanks from gas stations almost always leak. One gallon of oil can pollute 1 million gallons of water. One pin-prick size hole in an underground gas tank can leak 400 gallons of fuel a year. And all of this potential trouble lies upstream from the Llano Road water treatment plant. The site is in a “High Priority Greenbelt” area, on a Scenic Corridor, and surrounded on two sides by a Community Separator, voted in 2 years ago by 81% of the voters to protect green open spaces between cities. The surrounding land consists of seasonal wetlands, and lies within the area of critical habitat for our local endangered species, the California tiger salamander. Quite apart from local impacts, why would anyone want to build another gas station now, with the climate crisis looming over us, gas stations plummeting, and sales of electric cars rising rapidly? If built, how soon will this one become an obsolete white elephant and who will pay for the clean-up costs? The project came to preliminary Design Review and was sent back to the drawing board for a redesign, mainly because it is in a scenic corridor and not suitable for a rural area. It will come back for a second preliminary Design Review, but we don't yet know when. The site is zoned for Limited Commercial and development would require a Use permit. You can submit comments to staff at Permit Sonoma, Daniel Hoffman [email protected] and [email protected]. Totally insane when there are so many gas stations within a short distance including car wash. This is another out of area strip mall developer from LA and Idaho. This will force out local businesses and the money generated will be leaving the county. Sonoma County has become a profit center for speculators as we are "wine country". (insert puking noise here). It's not totally insane, considering there is a KBHomes development planned across the intersection. 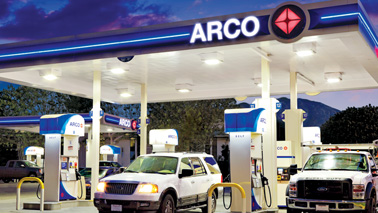 After Costco, Arco is the cheapest top tier gasoline, so there is that. I think this property is on the edge of a community separator and is designated by the County as scenic highway. With the zoning being ag/rural residential I believe with the corners being commercial. Where did this information come from? No one I know has heard a thing. KB Homes is a national construction/development company with a few projects in Rohnert Park. Thanks for sharing where this came from. Thanks for sharing where this came from. My apologies, while there is a giant KB Homes sign across the intersection, it's advertising homes on RP Expressway and not on 116.
heat pump vs gas furnace?? Hwy 116: To Rehabilitate or to Make Safer? ?